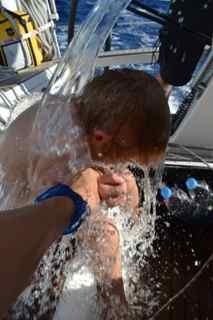 Nils was first out with having a shower. 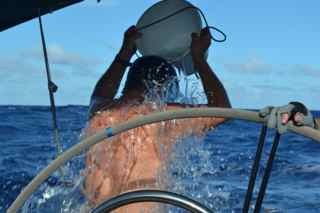 We first filled up a bucket of seawater, approx 25-27 degrees pouring ourselves as a shower. Showering in seasalt shampoo. Rinse first time with sea salt again and second time with water from the tank. Best way to keep down the water consumption. Worked perfectly well! 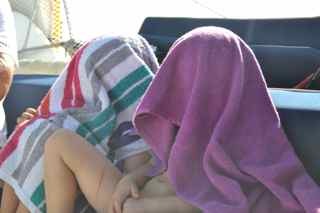 These guys were not very fond of the idea though… Inez screamed all the way while Alex was being showered. They both shouted like they were being beaten! However very happy afterwards. After a few times the smile came back and they realised that a shower wasn’t too bad as it cooled them down.